as part of an experimental cabaret curated by Valerie Kuehne. 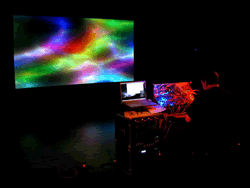 Buchla and Continuum at an open experimental and improvised interactive musical collaboration. Richard performed live solo electroacoustic music with his Buchla/Continuum analog modular synthesizer system Friday night, Jul 2, and on Sunday afternoon, Jul 4, with thereminist Thomas Zunk. The performance included the world premieres of our transcriptions of two sections from Olivier Messaien's "Quartet for the End of Time", arranged for Theremin and Buchla. Direct recording of streaming live performance available on Soundcloud. Richard performs and gives a workshop at International Live-Media Festival's 10th Edition at the historic Palazzo Re Enzo in Bologna, Italy. See photos and reviews. Richard performs Buchla synthesizer solos. Richard performs electronic nocturnes with his Buchla 200e/Haken Continuum system as part of electro-music's New Year's Eve 2010 live streaming concert featuring 24 hours of live electro-music - 30 acts, 3 continents, 8 countries. Richard performs live with Buchla 200e & Haken Continuum, presents seminar demonstrating the system and hosts an iPhone improv. Richard premiers new films and music funded in part by the New York State Council on the Arts. Richard gives a workshop and performance sponsored by the National Electronics Museum in Linthicum, MD. Rhys Chatham's "A Crimson Grail"." Richard plays live for Summer Solstice 09 broadcast – 15 hours of live electro-music from 24 artists in 7 countries. Baltimore Electronic Music Fest 2009: June 27, 2009 at 10 p.m.
Richard performs live with Buchla & Haken Continuum. Richard's film "LUX" selected for screening. Richard performs new works and improvisations for high-definition film projection and synthesizer in quadraphonic sound, featuring the Buchla 200e modular analog synthesizer, controlled by the Haken Continuum Fingerboard, an innovative 3-dimensional keyboard. He will also conducts a workshop on Multi-Dimensional Control for Realtime Analog Synthesis Performance. Richard presents a concert of live electronic music featuring new works and improvisations for high-definition film projection and synthesizer. Richard will be performing with his Buchla 200e modular analog synthesizer, controlled by the Haken Continuum Fingerboard, an innovative 3-dimensional keyboard. Richard Lainhart 's film, "One Year," is part of the Installation Showcase @ Axiom Gallery. Richard performed live Buchla 200e & Haken Continuum set streamed from his studio. Richard's time-lapse film, "One Year," part of a 20-film festival. A live improvisational excursion featuring cutting-edge digital technologies along with old-school analog synths like Richard's Buchla 200e/Haken Continuum system and Jordan's vintage MiniMoogs. Richard will perform his Electronic Music Foundation-commissioned work "Threshold", for Kyma and electric guitar at Judson Memorial Church, New York, NY as part of Ear To The Earth 2008 NEW YORK SOUNDSCAPE festival. Richard's year-long timelapse film "One Year" accepted for exhibition. The world premiere of Richard's new film "One Year". Live Streaming New Year's Eve Travelling Concert, with contributors from Germany, UK, USA, Portugal and Canada, featuring a live Buchla 200e set streamed from his studio on Electro-Music.com from 9:30-10 PM. A Buchla 200e set with Jordan Rudess in the very heart of Moogdom. Etsy Labs, Brooklyn co-sponsored by Make Magazine and Create Digital Music. A solo set of Buchla 200e and Haken Continuum improvisations. This video of Richard's performance is thanks to Russ Sokoloff. "Re:Soundings Presents The Downtown Ensemble Upstate"
"An All-Moog Deep Space Excursion" – Electronic improvisations with Jordan Rudess, in honor of Dr. Robert A. Moog's 70th birthday.